With a few glimpses of nice weather recently, it seems that we can now start looking forward to spending more time in the garden. You need to make the most of the warmer days this year by getting the garden back into tip-top condition. When the sun comes out, you want to be able to kick back and relax, not perch precariously on a worn out, wobbly chair. So if your garden furniture needs a bit of added comfort, you can buy some seat cushions or even make your own out of old pillows. If you fancy a bit of a DIY project then you could even make some furniture of your own. Using just an old wooden pallet, you could soon have an exciting new piece of garden furniture. Okay so you might not have the budget to actually bring in the designers but a talented joiner could transform your outdoor space with some stunning glass decking. It really can turn some simple decking into a modern, sleek outdoor area. Inject a bit of colour and vibrancy into your garden with some lovely new plants. Take a trip to your local garden centre and have a look at what you could choose to liven things up. Just a few nice bedding plants can provide an instant new look without spending a fortune. Sometimes less really is more. When you want to spend time enjoying your garden, you don’t want to be surrounded by overgrown shrubbery or a clapped out lawnmower. 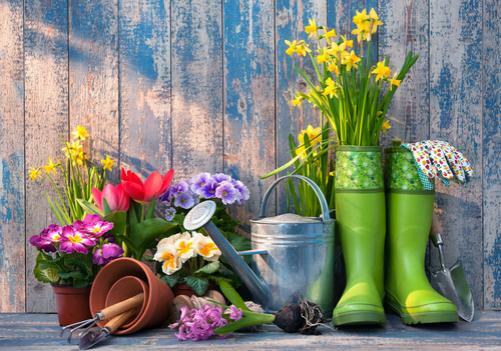 Have a good garden spring clean and, if you have a shed, you can get it into shape with a tidy up to make space for any tools or furniture that should get put out of the way. If you have any plants that are looking a bit lifeless or crawling ivy that is getting out of control, then get started on tackling it now so you can clear your garden ready for the sunny barbecue weather that is hopefully soon to come! A coat of paint will not only help to preserve your wooden fences, sheds, decking etc. it also can make your wood look like new. So arm yourself with some weatherproof paint and a paintbrush, then spend a day giving your wood a makeover. Whilst you are at it, you can check for any other exterior wood around your house that needs treating, like a doorstep or window frame. It is amazing what a difference a new coat of paint can do, even for old wooden chairs or benches. So that is Blueprint Joinery's top tips to breathing new life into your garden. Should you want any more information on our range of glass decking systems, or any of our other products, please do not hesitate to get in touch with our team today.